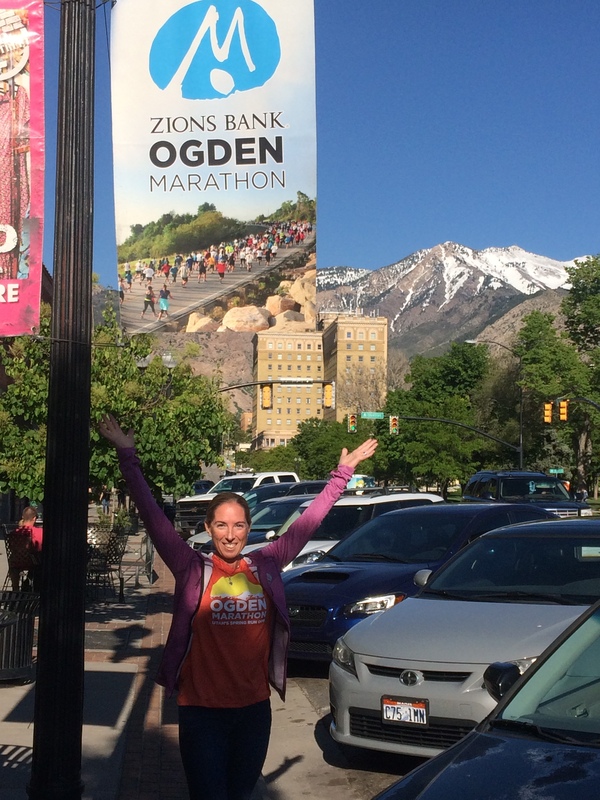 Two weeks removed from the Ogden Marathon, and I’ve had some time to really reflect on the great time I had there. 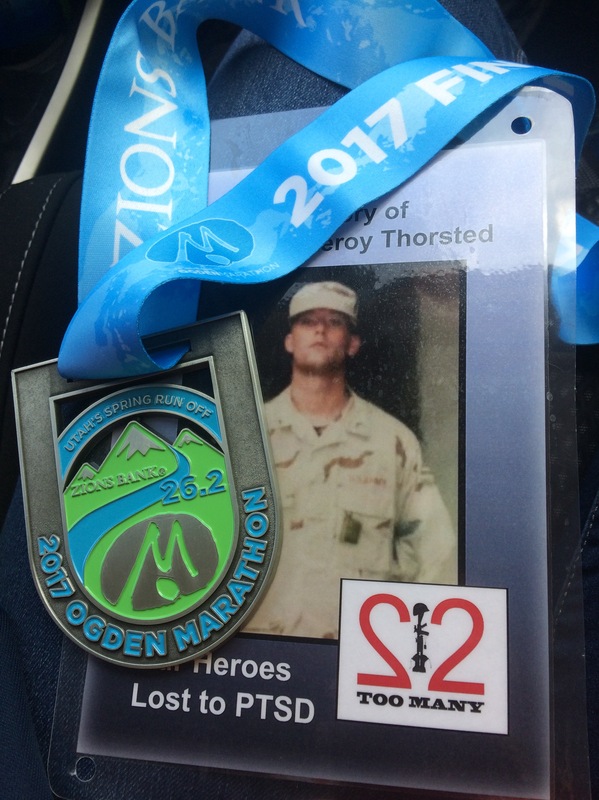 I was very nervous going into the race – not so much the race itself but the fact that I was meeting the family of the soldier I was running to remember (Bryan Thorsted).The family would be waiting on me to finish, and I hoped that they would ‘approve’ of my effort in the race. Needless to say, they were wonderful people who welcomed my husband and I to Ogden with open arms. I felt like I had a chance to meet some long lost family members, as we have this unusual bond that brought us together. It was a very meaningful race and post-race experience for me, and I am thankful that I was able to spend time with the Thorsted family after crossing the finish line. Chris and I arrived in Salt Lake City late on the Wednesday night; the race was on the Saturday. We stayed in Salt Lake City that night, preferring to get our rental car the next morning and drive to Ogden during the day, which is about an hour north of Salt Lake City. It was pretty easy to get there, and we had no issues getting into Ogden and finding our hotel (Marriott), which was close to the historic 25th street. Most importantly, the hotel was about a block from the finish line! Chris and I found a fabulous place (Rooster’s Brewing Company) that brewed their own beer, and I indulged in several pints of a new brew – O-Town Nut Brown. This was a fast favourite, and it ended up being my post-race beverage to celebrate the finish. We had several meals there because it was a great location, served good food and had tasty beer options. Dulce de leche waffle the day before the race. I’m not sure if recommend doing that to your body. We started the day with a trip to Waffle Love, where I ordered the most ridiculous waffle I had ever seen. This is not your standard day-before-a-race meal by any stretch, and I actually only finished a small portion of it (cinnamon sugar coated waffle with dulce de leche drizzle, topped with whipped cream and a stupid amount of dulce de leche ice cream, also drizzled in dulce de leche). While it may not have been a smart breakfast choice, it definitely was delicious! You definitely need a car to get to the expo for packet pick up. 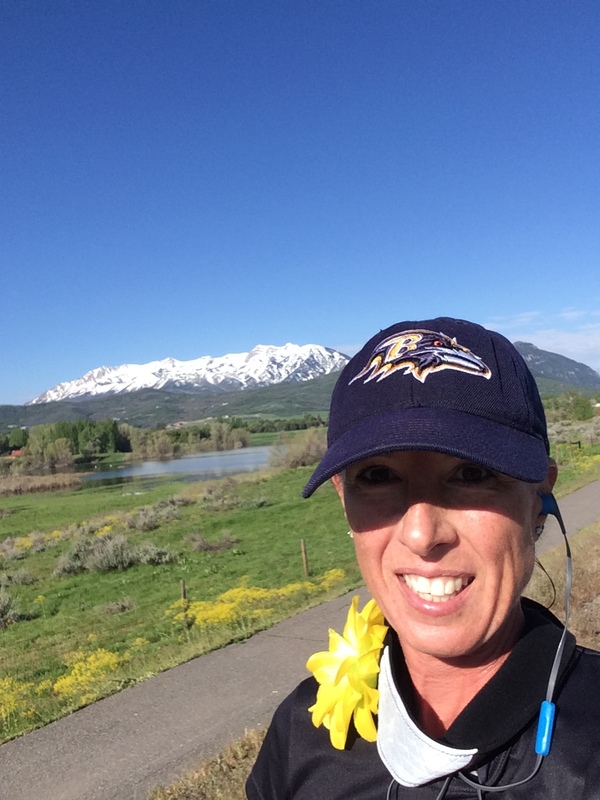 With my husband driving, we somewhat easily found our destination – the Weber County Sports Complex. The parking lot was packed, so we expected a large crowd. When we arrived to the expo, it was located where they have an indoor ice rink. The expo was fantastic, I have to say. Not just the usual vendors, but a nice mix of various things to look at, learn about and do. I headed straight for my bib and shirt pick up, then made a beeline to find where I could get my KT tape-up for the run. I enjoyed chatting with various people manning the different booths; they were so friendly and eager to help. 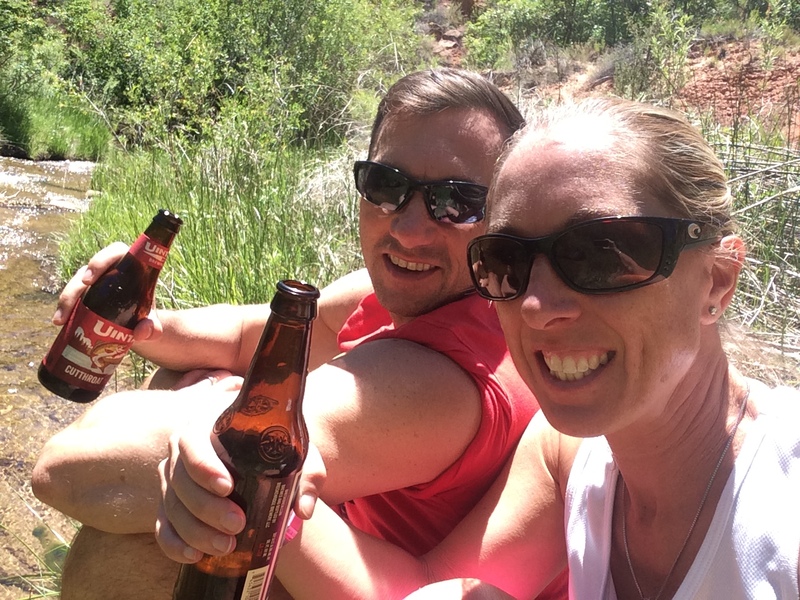 We got a lot of great tips on the hiking we planned to do the week following the race, as everyone had their favourite hikes in the various national parks. 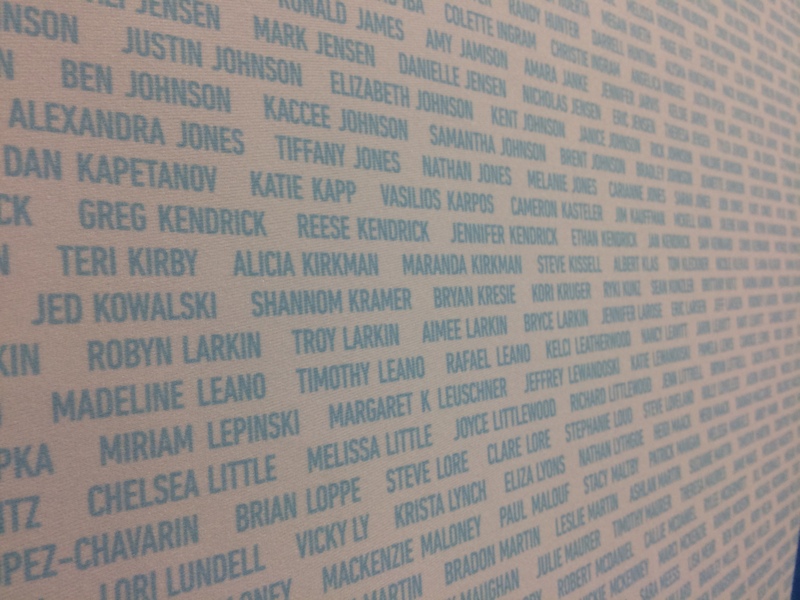 Found my name in the marathon backdrop! I love the long sleeve shirt given to the participants; I’m very sad that I noticed a hole along a seam after a couple washings. I am not a seamstress, so I will try to find someone else who can help me repair my shirt. The colour is great and the design is really nice. I also loved their selection of race merchandise – probably the best of any race I’ve participated in. A bit pricey, but it was good quality. I don’t like to buy race stuff until after I finish the run (I don’t want to jinx it), so I held off on purchasing the light jacket that caught my eye. I did confirm that the race merchandise booth would be set up in the finisher’s festival area, so I should be able to find the jacket there post-race. 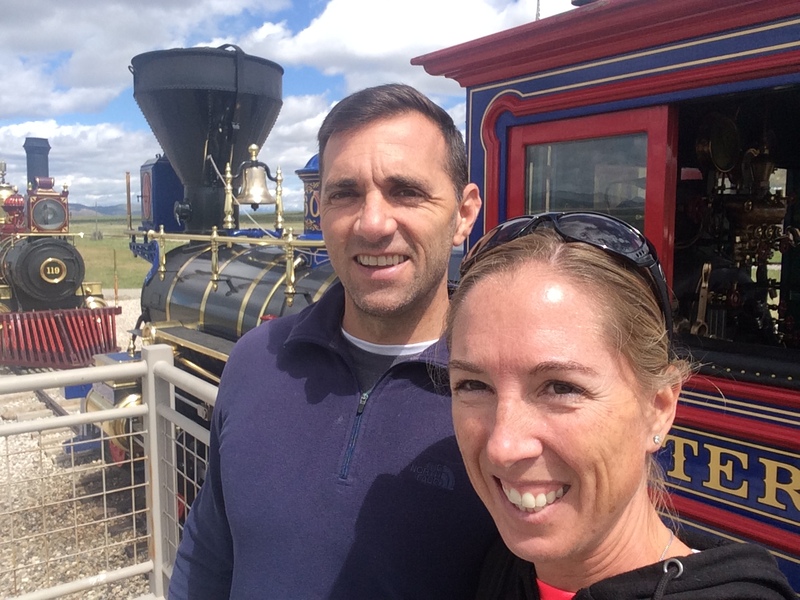 After about 90 min at the expo, Chris and I hopped in the car and went to the Gold Spike National Monument, where the first transcontinental railroad was joined. It’s literally in the middle of nowhere, about an hour from Ogden, but the drive is pretty. 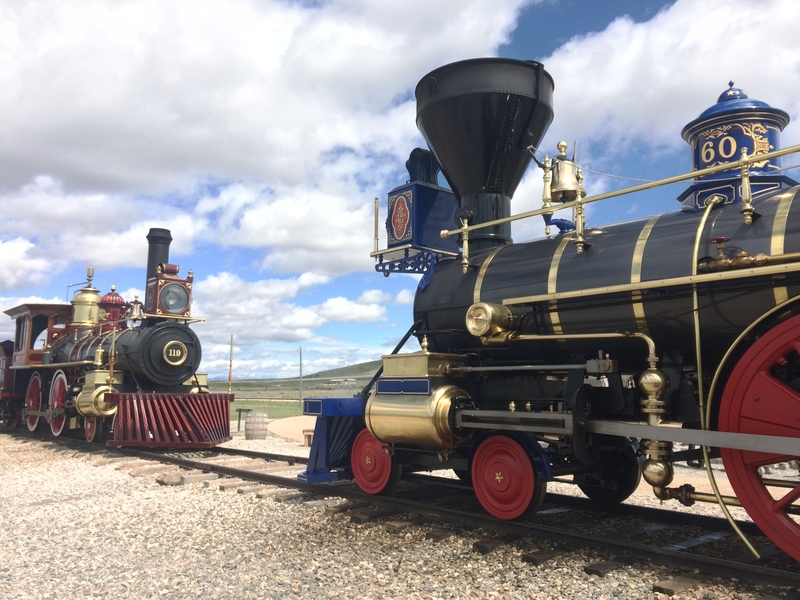 We spent some time there learning about the building of the railroad, seeing the replica engines of the two trains that met in 1869 and absorbing the history from such a momentous occasion. 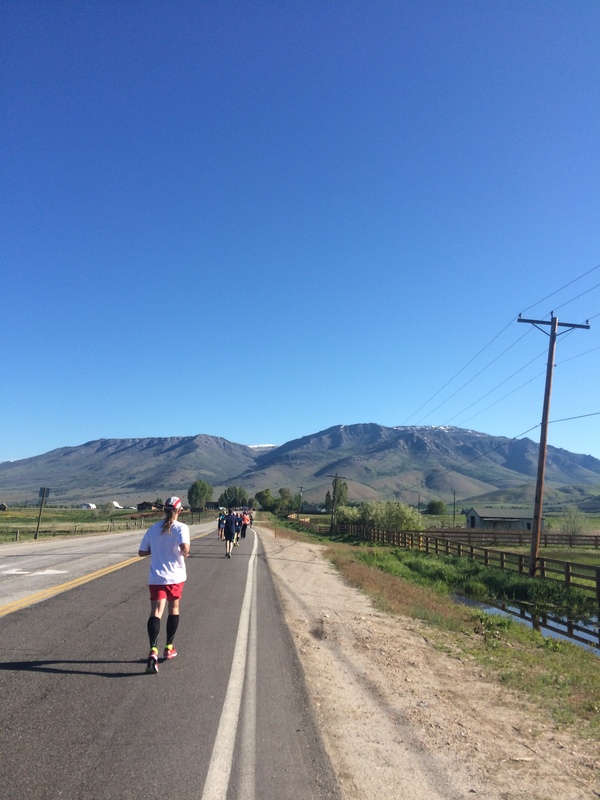 We headed back to Ogden to get an early dinner and turn in at a reasonable hour for the next day’s run. Getting on the bus to the start at a ridiculously early hour. My alarm clock went off at 4:25 am, telling me it was time to get a move on. Because the race finished near the hotel, Chris was planning to sleep in and meet me close to the finish line. I tried to get ready quietly, but it was hopeless. Luckily, Chris is very understanding and probably fell back asleep within a minute of me walking out the door. Wrapped in a snuggie and with a bagel and coffee in hand, I headed into the cold to walk the two blocks to the transportation that would take us to the start line. The race started way up past the canyon, out past Huntsville, and we had to run the 26.2 miles back into town. I’d never run a point to point race like this, where the start and finish were so far from each other. I also had never run a race at altitude or a net downhill course. This was a lot of ‘new’ for me, and I was excited. Or as excited as I could get at 5 am. Buses were leaving from the rendezvous point, and runners were getting on as quickly as they could find a bus – it was cold outside and the bus at least offered some warmth. What we didn’t plan on was the fact that we would again be outside when we reached the start of the race, where we had to wait for more than an hour in the even colder weather (up in the mountains!). So I got on the bus and tried to hold a decent conversation with my seat mate, all the while my pre-race jitters were building. 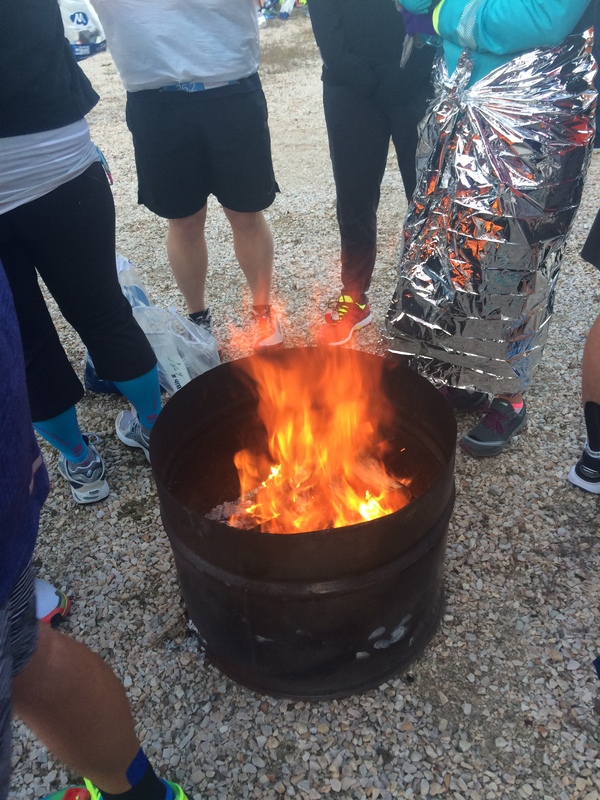 Fire pits were a great way to stay warm at the start line. As the bus pulled into the starting area, the sun was only just coming up. I quickly realized that the runners who had arrived before us were gathering in large circles around makeshift fire pits that were set up for that purpose. Amazingly, some people had camped in the field next to this area the night before (what??? The cold! Ugh!) and were simply able to roll out of bed and start their race. I walked around for a bit, hit the port-a-loos and found a spot by one of the fires. That was a life saver. I chatted with the two men next to me while I struggled to stay warm. It was a bit of a reality check when the announcer said ‘one hour until start time!’ Welp. We all just groaned and continued chatting away. And actually before we knew it, the national anthem was being sung, and runners started to self-seed in the start area. By this time, the sun was fully up and as predicted, it was a lovely day. Which apparently is not always the case for this event. At the expo, I had heard from at least a half dozen people how awful the weather had been the previous 2-3 years, complete with many people getting hypothermia on the course in 2016 due to the cold temps, rain and wind. 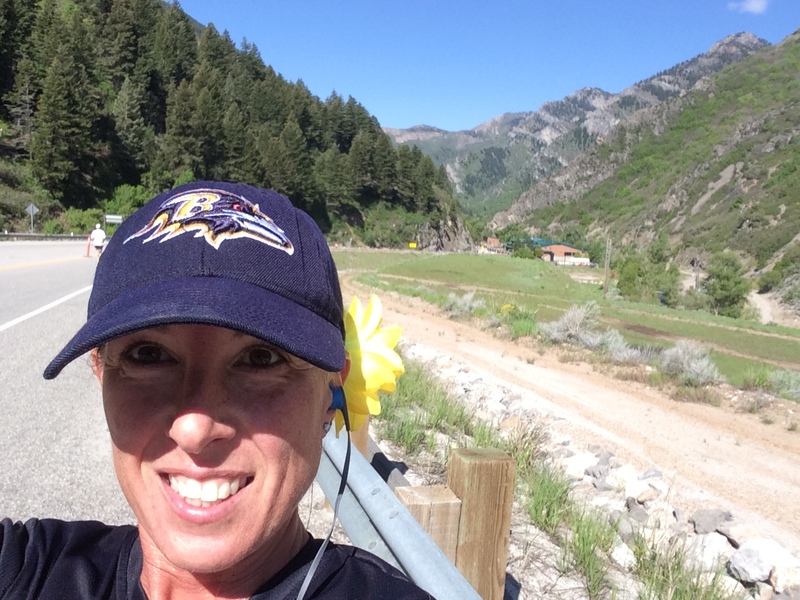 Thankfully, I wasn’t faced with that situation; instead, I had what looked to be pretty beautiful weather (it did warm up a bit more than I liked by the end) stretching out before me as I ran Utah’s Spring Run-off. The gun went off and I couldn’t feel my feet – they were essentially frozen from the cold. Fun times. This wasn’t the first race where I couldn’t feel my feet for literally miles (I’m looking at you, Tulsa Route 66 Marathon and Louisiana Marathon), so I knew if I just started running, eventually they would thaw out and I’d be good. I also knew this wasn’t likely to happen for a while, and it did indeed take me about seven miles for things to all be normal. Of course, I was actually warm by this point in the race, warm to the point where I was running in short sleeves around the same time my feet felt normal. With that sun shining brightly on the course, it was only a matter of time before we felt its warming presence. In the first couple miles there was significant downhill, which felt fun! I felt like I was flying and really had a great time seeing this stretch that was so remote from Ogden. 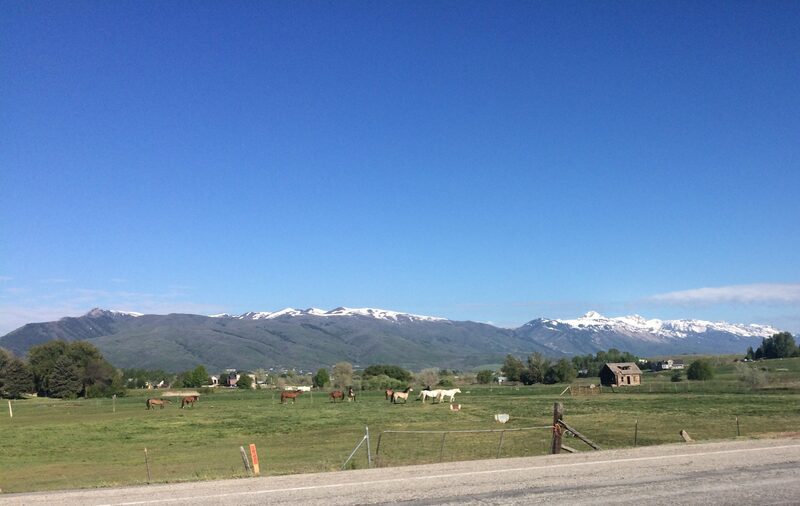 We continued past beautiful ranches, always seeing mountains as part of the backdrop. Horses and cows were our primary spectators along much of the first half of the course, and while I wasn’t really having a great time settling in to the running, I was thoroughly enjoying the scenery. We got to mile 8, where the course took a right turn, and I saw a field of horses, some playing, others grazing. With the sun shining and the vivid colours all around, it was a beautiful sight. This is where I realized I may have headed out west to higher altitude a day too soon. The whole race I felt a bit lightheaded and ‘off’ and I really think it was the thinner air getting to me. Live and learn, I guess. I had a good consistent pace through about ten miles, but with the altitude getting to me, and I had to ease up in order to breathe. Not to mention that by the half way point, my sciatic nerve was acting up and causing some serious pain. In truth, I was so happy to get to the half way point as I wasn’t having a great race overall. Making it to that milestone was a huge boost, and was one that got me motivated to continue running around the Pineview Reservoir. Getting ready to head down the canyon! Loved the quotes on each mile marker! Every mile sign was worth keeping your eye open for – and not just to help you mark the miles. A fun or inspirational quote was included on each one. So when our course met up with the half marathon course at miles 13.1, I then had two sets of markers to read and enjoy along the way. Half marathoners started 30 min earlier than the marathoners and relay runners (and at a different location, obviously), so we didn’t see any half marathoners at all along the course. At least I don’t think we did. 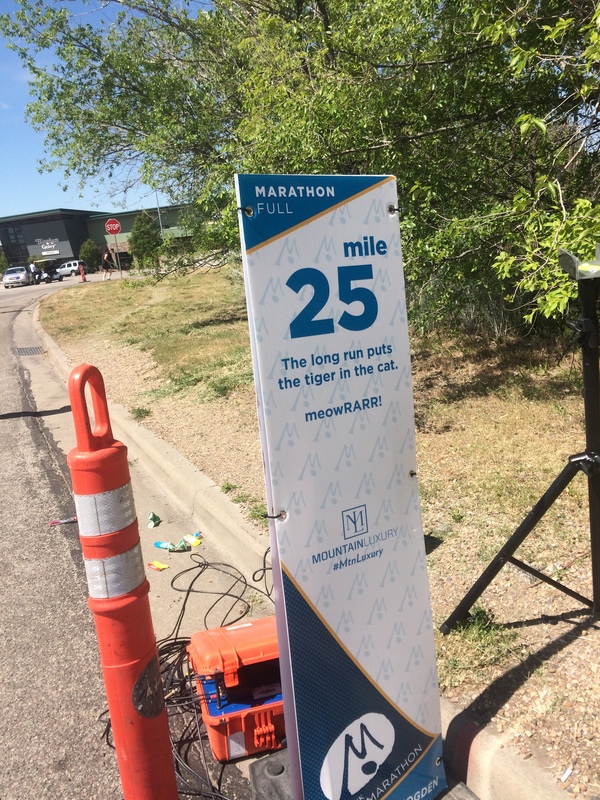 I thought that was odd at first, but I guess the organisers wanted to have the half marathoners finish before the bulk of the marathoners and relay teams finished their races. I noticed lots of medical assistance available at various aid stations, with a few runners seeking assistance. When things don’t go as planned, it’s great to know you can easily find assistance. Ogden gets a gold star on this. I’m thankful I had another race without needing assistance. Throughout the course, I chatted with various runners who ran with me for a few minutes. I know I’ve said it before, but in all honesty, the people here were among the friendliest people I have ever met. And it was genuine. I enjoyed trying to keep up with some of the runners who shared a few moments with me. With my sciatic nerve acting up and the overall ‘off’ feeling I experienced, I wasn’t too interested in pushing it much harder. I was on pace for between a 4:10-4:20 run by my estimates at around mile 15, and I was happy with that. I wished them all well as they charged ahead at a faster pace. 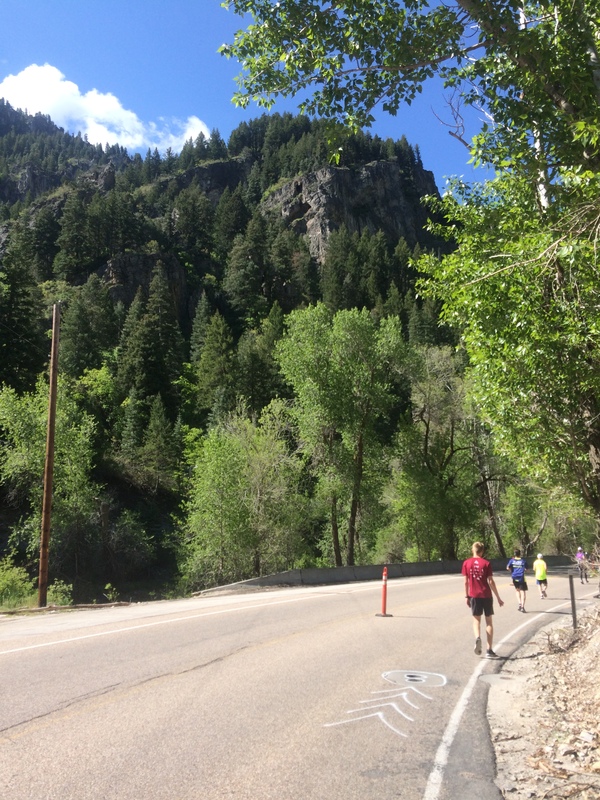 After about mile 9, it felt like we were on a continuous slight uphill (even though I know we weren’t) until we finally came to the park where the downhill began in earnest – heading down the Ogden Canyon and into Ogden. I’m not sure what the grade was, but it was definitely a downward slope. I welcomed this, and enjoyed the feeling of having gravity help me make it to the bottom of the canyon. At one point, I saw a gorgeous waterfall. There were so many things to take in and enjoy on this course. I can do anything for nine blocks. 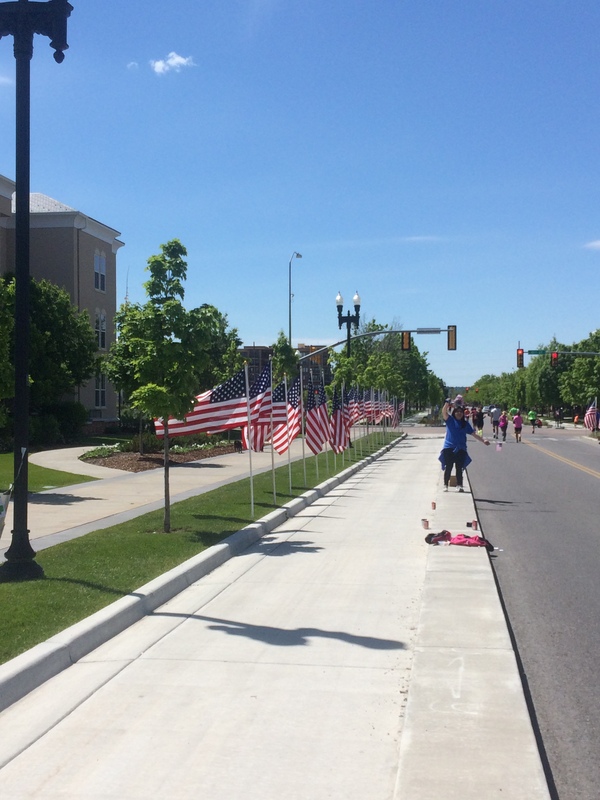 At five blocks left, there was a group handing out American flags. I started to tear up as I grabbed one, knowing I was bringing it home for the soldier on my back, who had a chance to see his hometown in a new way. Crying and running is hard, so I willed myself to stop crying so I could have a respectable finish. With one block to go, I saw my husband and the mom and sister of Bryan Thorsted on the side of the course, waiting for me. 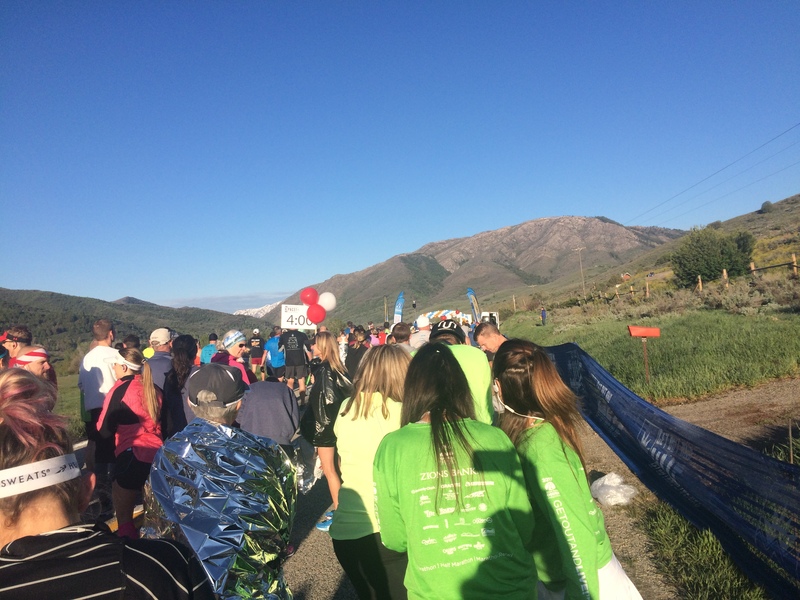 I detoured over to give Chris a kiss, hugged Susan and then I sprinted towards the finish. I passed several people in my quest to cross the finish line, which I did with a smile on my face. And then I proceeded to gulp air like I was a fish out of water. Final time: 4:24:04. I remembered to shut my Garmin off when I crossed the line this time. They put the medal around my neck and I continued walking down the chute to grab some water and a soda, then out of the finish area to find my cheer squad. Stacey and Susan met me near the finish line with this to help cheer me in! I quickly found my cheerleaders, and we made plans to meet for lunch in a short while. I desperately needed a shower, and since the hotel was so close, I knew I could dash there, shower, change and get to the restaurant for my beer in about 30 min. I was so fast with the shower and changing that we also headed back to the finish festival to purchase the jacket I had my eye on. While in line (in the hot sun), I suddenly felt faint and barked at my husband to get me a beer (just a short distance away). The people in front of me looked very worried and offered me their half consumed bottles of water as well as offered to get me some chocolate milk. I knew I just needed a cold drink – preferably the beer, but that is just typical of the people in this race. Thoughtful, kind, helpful. I got my beer and immediately felt a little better. After completing my purchase, we headed back to the restaurant, and I stopped to get my post-race photo at the step and repeat. Holding my beer and the medal, I grinned from ear to ear. The photographer walking by thought it was a funny picture and snapped a few shots of me, too. I hammed it up and even drank the beer for another shot. I hope they use one of them in the future. Heading back to Roosters for the third time on the trip, we met up with Bryan’s mother, Susan, sister (Stacey), brother (Jeremy) and sister-in-law (Vicky), along with Jeremy and Vicky’s three beautiful children. It was a meal where we had the chance to get to know each other a bit, and they graciously shared stories, photos and memories of Bryan with me. He was obviously loved, and he is greatly missed by his family. This was such a touching experience to get to know someone in this way. I was only the second person to run for Bryan through 22 Too Many, and I am the only runner they have met. It was obvious that my coming out there meant a lot to the family. After lunch, we all went to the cemetery to pay our respects to Bryan. 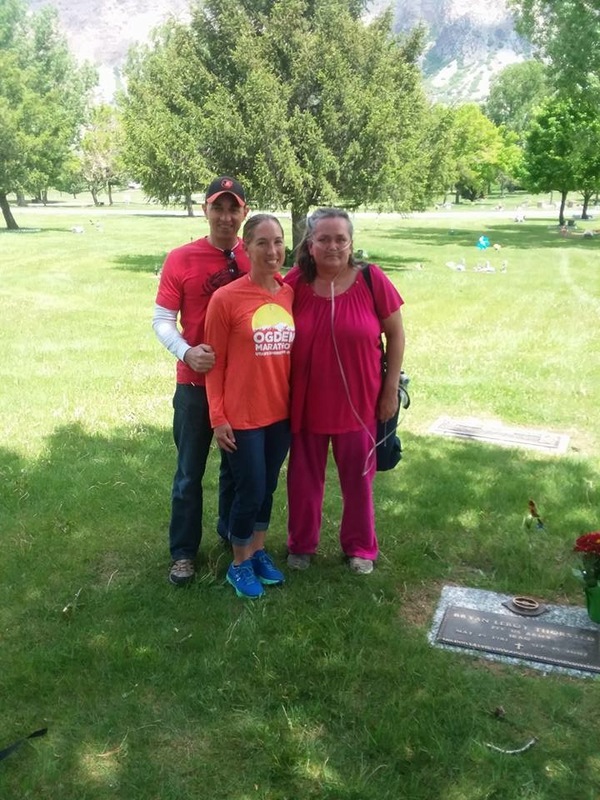 It was there that I gave his mother the medals I earned in Bermuda (End to End walk) and from the Ogden Marathon as a tribute to her son, reminding her that he is not forgotten. It was a privilege to run for him, and so very special to do it in his home town, where I could then present the medal in person to his family. These are moments that I will treasure forever, to know that I was able to (as my friend Keith would say) bring light to darkness in this small way. We shared hugs again and headed our separate ways. I know that I have gained a new ‘family’ in my life, and if I am ever again in the Ogden area, I will certainly be reaching out to connect with them for the chance to share another afternoon together. The trip to Utah didn’t end there for me. 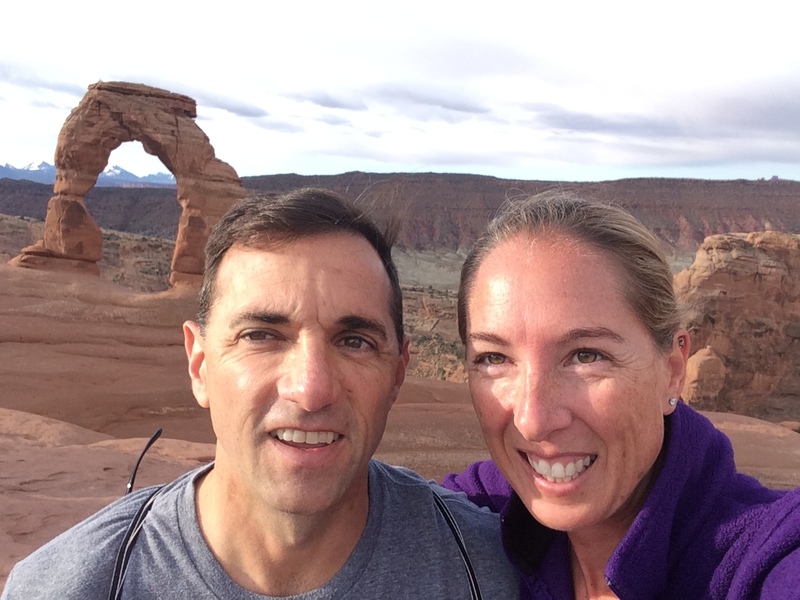 My husband and I had wanted to go to Utah for a long time with the goal of visiting some of the national parks located in the state. 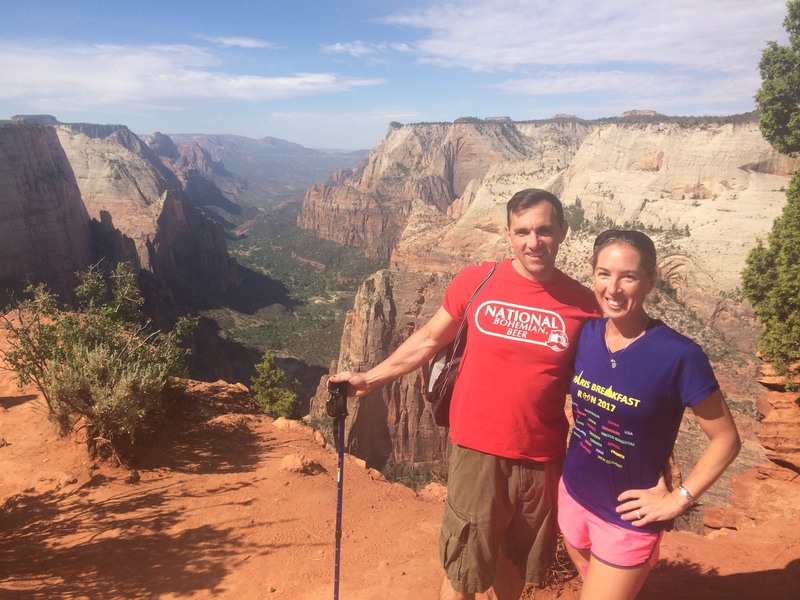 Since I selfishly added a marathon into our itinerary, I promised that I wouldn’t complain when we hiked the days following the race. So sure enough, on the Sunday (the day after the race), we were doing a short 4 mi hike in Capital Reef National Park, followed by a 6 mi hike on the Monday at Calf Creek, as we drove Scenic Route 12 toward Zion National Park. The hikes only got longer and more difficult from there, and while my quads were very sore from the downhill race course, I didn’t complain at all. It was a glorious trip and I’m so thankful my husband and I were able to enjoy so much outdoor time in Utah. 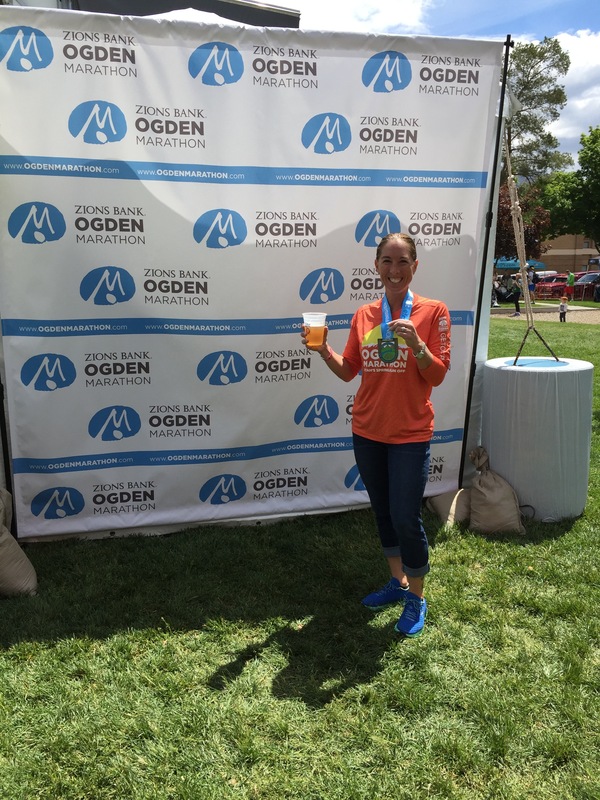 Amazing race report! Big congrats!! Sounds like a great time! And it looks very beautiful there! 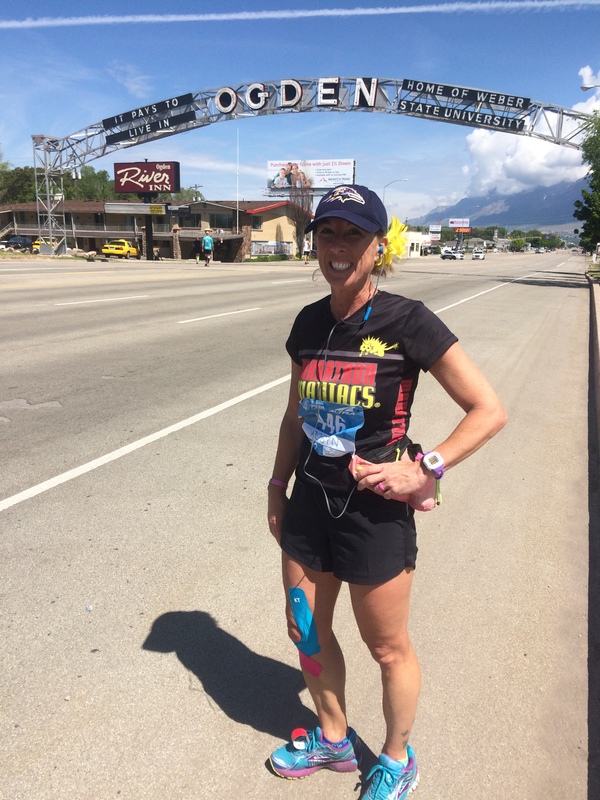 Great race report as always Robyn!! 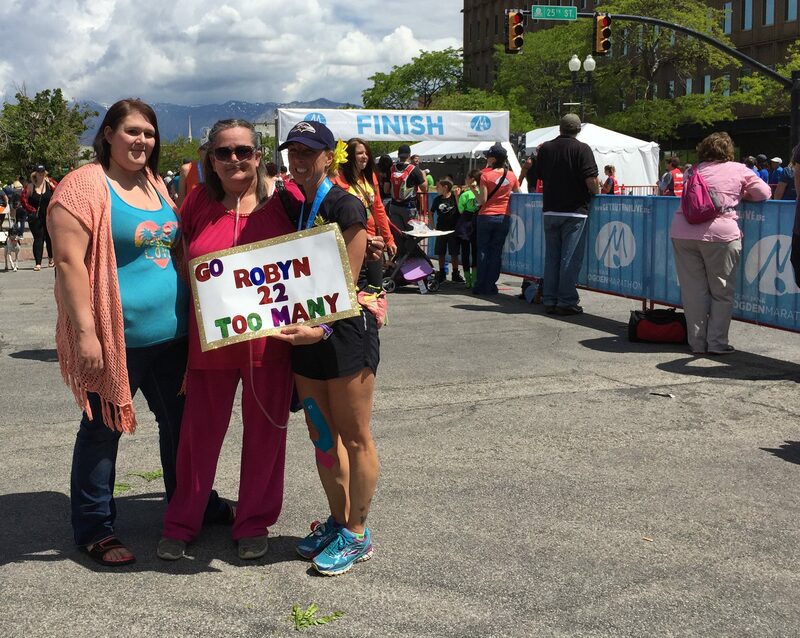 And, congrats on another marathon…I lived not far from Ogden for a couple years, but that was before my marathon running days! Really cool that you guys got to enjoy a vacation afterwards and explore the area as well. 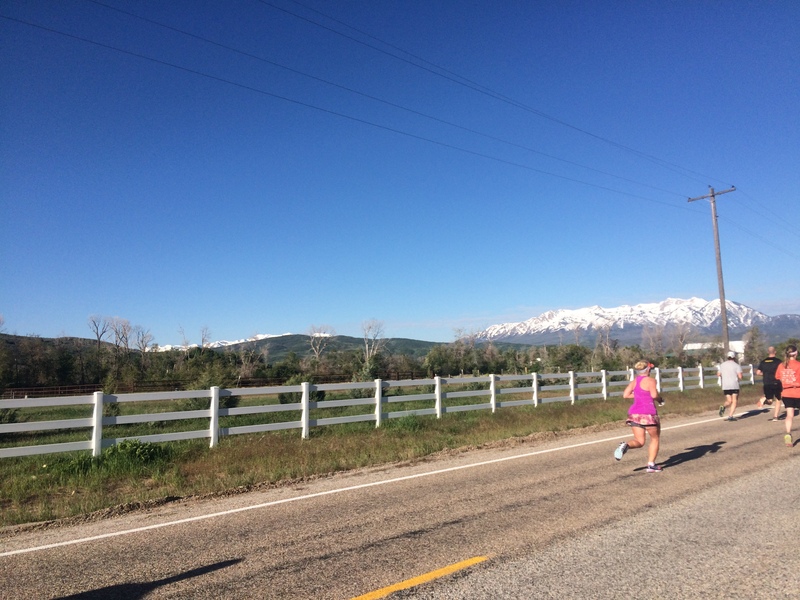 I have noticed that races at elevation are really tough for me…I struggled mightily in Reno last month and last year ran the Salt Lake marathon where the altitude put a beating on me as well. Great job!! I knew the elevation was going to be a factor – it was just not known how much of a factor. Oh well! I think Colorado is what will scare me the most when I make my way to a race there. Utah was beautiful, the people were so friendly and welcoming and we had a great time during our two weeks there. Not sure I could live out there (I’m a warm weather and beach girl), but it certainly is nice to visit and see places like that. Sorry to hear Reno was rough – I need to go to your blog and read about it. I’ve been really bad about catching up on a few things. Somehow life has gotten in the way of much of my routine! Hope it was still a great time, even if the elevation wasn’t fun.